When Seeing Eye puppies are between 13- and 19-months-old, their puppy raisers return them to The Seeing Eye. For their first month at The Seeing Eye, dogs undergo health screens to ensure they are healthy enough to work as guides. They are neutered or spayed, and given a dental cleaning. An instructor works with a yellow Labrador retriever around a barrier of cones and caution tape set up on a side walk. Each dog is assigned to a Seeing Eye instructor with whom they will train for four months. Basic training takes place on The Seeing Eye campus before moving to the streets of Morristown. They are regularly trained in a variety of rural, suburban and urban environments with each dog testing the ultimate urban environment before completing its training: New York City. The bond between Seeing Eye dogs and their instructors forms quickly and is very strong. The dogs are taught to guide with a combination of repetition and praise. Clicker training is used to enhance the dogs' skill in targeting specific objects. Half-way through the training period, instructors take a blindfolded walk with each of their charges to test their dogs’ abilities. At the end of the training cycle, the blindfold test is repeated on a more complicated route to ensure the dogs are ready to begin work as Seeing Eye dogs for their new owners. 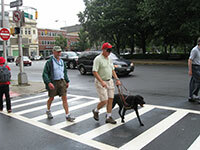 A Seeing Eye instructor is walking under blindfold while a black Lab guides him across a street. Another instructor is following behind, observing the dog’s work. Instructors train a string of approximately eight to ten dogs from start to finish. Once the four-month training cycle ends, the instructor will enter class, which is where they train the dogs with their new owners for 25 days if they are a new Seeing Eye dog owner, or 18 days if they are returning for a subsequent Seeing Eye dog. Each instructor is assigned four students with whom he or she will work with for the class period. It’s important for the dogs to form a bond with their handler and enjoy his or her job to be an effective and safe Seeing Eye dog. One of the most important aspects of the time spent training is the bonding that takes place between a Seeing Eye dog and his or her new owner.